everton-mad has 92 articles published. Everton may be without seven first-team players including Romelu Lukaku and Ross Barkley as they look to remedy their poor home form against Southampton. They will attempt to record just a fifth home win in the Barclays Premier League this term against Saints on Saturday with a squad that has been stretched by injuries and suspension. Phil Jagielka and Tom Cleverley are not yet ready to return, while James McCarthy is suspended following his dismissal against Crystal Palace in a game that saw Leighton Baines, Aaron Lennon, Barkley and Lukaku all pick up knocks. Romelu Lukaku has been carrying a little bit of a problem, we're going to assess him today if he can make the squad or not. He didn't train yesterday and we're hoping he can train today and we'll assess him from there. "I don't think any of those is a long-term injury, they are more the effect of a big amount of games in this period and it's probably a question of hours rather than weeks." Everton's most recent home game saw them defeated 2-0 by Arsenal and the hosts produced a performance their manager termed "fearful". It was an eighth reverse of the campaign for the Toffees at Goodison Park and Martinez knows that if their away form matched their results at home, they would be a lot higher up the table than 12th. "We haven't been able to celebrate enough victories in front of our own crowd; that's been a real disappointment this season," Martinez admitted. "There are contrasting results, I wouldn't say performances – I think at times we've had performances that have been good enough to get positive results. That's a contrasting story that is very, very difficult to explain." Deposit at least £10 and receive a 100% bonus worth up to £30! A complete record of competitive matches played between the two teams. Everton boss Roberto Martinez spoke of his optimism surrounding the club's FA Cup semi-final with Man United after believing his team had demonstrated crucial progress in their 0-0 Premier League draw at Crystal Palace. Everton had to play with 10 men after James McCarthy was shown a second yellow card seven minutes into the second period, but amid intense pressure they remained resilient and earned what was ultimately an impressive point and clean sheet. United's 2-1 win in their quarter-final replay at West Ham earlier in the evening ensured they would face Everton at Wembley on April 23, but despite his team's disappointing 1-0 league defeat at Old Trafford earlier this month and the defensive lapses that have ruined their pursuit of a top-six finish, Martinez was adamant their performance against Palace proved that this time they will be "ready" for United. "But that's not enough on its own, you need tactical awareness as well, and we showed that. We were very clear in what we wanted to do, and then it's about managing the game to allow us our threat as well. "It all matters in the final weeks of the campaign. We've lost too many points late on. It's now you want to hit your top level. You want to shine in the last few weeks of the season. "To play a semi-final of the FA Cup against Manchester United at Wembley is as good as it gets. We'll enjoy it and will be ready. "It's the same weekend 50 years ago that Colin Harvey became a hero by scoring the winning goal in the semi-final of the FA Cup (against United). Maybe that's a sign of something to come, but it will be terrific to be able to have one of our players writing new history." Roberto Martinez spoke of his optimism surrounding Everton's FA Cup semi-final with Manchester United after believing his team had demonstrated crucial progress in their 0-0 Premier League draw at Crystal Palace. We were very clear in what we wanted to do, and then it's about managing the game to allow us our threat as well. You want to shine in the last few weeks of the season. We'll enjoy it and will be ready. Maybe that's a sign of something to come, but it will be terrific to be able to have one of our players writing new history." Asked of McCarthy's two bookings- the first for a foul on Yohan Cabaye and the second for a block on Yannick Bolasie – Martinez replied: "I thought James McCarthy was trying to stop Yannick Bolasie getting to the ball. I thought it was a very harsh second yellow card." The draw took fellow cup semi-finalists Palace to 38 points for the season and manager Alan Pardew believes his team are now safe. 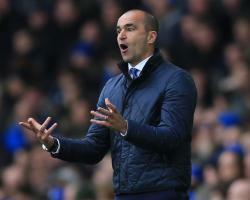 Roberto Martinez insists he is under no greater pressure with Everton now than he was when fighting relegation in four seasons with Wigan Athletic. There is a growing number of fans who are becoming increasingly disgruntled with the Toffees boss after another season of underachievement. Everton are 14th in the Barclays Premier League table having won just four matches at home all term and, despite an FA Cup semi-final to look forward to, having also reached the last four of the Capital One Cup, the natives are becoming restless. There were 'Martinez Out' banners at the weekend's match at Watford and there are likely to be more protests during Wednesday's game at Crystal Palace but the Spaniard is adamant he is not feeling the heat. "As a manager, you understand that there is always the pressure you put on yourself," he said. "With the scrutiny of the outside or not, you always follow an intense way of working which, in the last seven years I have been involved in the Premier League, has always been the same, and I won't stop doing that. "You need to be very consistent as a manager; you need to be able to work under the demands this position requires, and I wouldn't say that is any different to what I have done in the last seven seasons at this level. "You cannot control outside scrutiny. As a manager you concentrate on what you can affect, and we can affect many things from now until the end of the season." Footage has emerged of Martinez involved in a discussion with a supporter at Monday night's under-21s victory over Chelsea at Southport, although it is only a video and nothing of the conversation can be heard. The Toffees boss said he welcomes dialogue with fans, although he dismissed any suggestion the exchange was anything other than friendly. "It is not a confrontation. I always want to know what the fans feel, and I always respect a fan who supports our club who has a genuine interest in the club," he added. "I have enormous respect for people who share passion for the club – Evertonians have been through a lot but now is my third season here and I understand and share their frustrations. "We will never look away from a fan's opinion – if I have an opportunity to share a few moments with a fan, I will always do that as it is important to know how fans feel. "I have no problems with the passion the fans have towards the team and the club, because that is the strength we have as a club and we will do everything we can to make them proud. "I can understand the frustration. I can understand that in our football club we all share an incredible amount of passion. "We are as disappointed as the fans are. We need to be close together to use each other's strength. "The only thing that matters to us is to make sure we finish the season really strong and get high up the table." 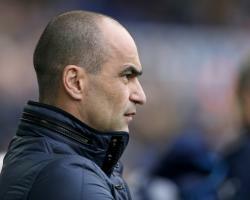 Martinez admits Everton have been their own worst enemies this season, losing a number of matches they should have won. "There is not such a thing as blame," he said. "We put a lot of work into assembling this squad which breeds excitement and incredible potential but the reality is we have been really good in certain aspects and really poor in others. "We have thrown really good positions away. Clearly we need to get better. "We are in a significant moment of the season. There is no time to look back but just be as good as we can in the next game." Everton will be without captain Phil Jagielka for the next two matches with a hamstring injury but the defender has not yet been ruled out of their Wembley semi-final on April 23. "Phil is always a quick healer and we will have a better idea on Monday or Tuesday next week." 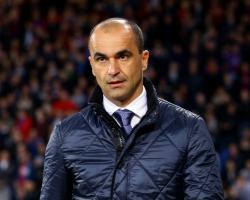 Roberto Martinez hopes it is Everton rather than Watford that can emerge from their Barclays Premier League slump when the two FA Cup semi-finalists meet at Vicarage Road. Involvement in the latter stages of the cup has brought the league campaigns of both teams to a grinding halt, with Everton losing their last three matches and Watford their last four. Coincidentally, Everton's next league game after Watford is against the Hornets' FA Cup opponents Crystal Palace, who have not won a league game in 2016. First and foremost I think Watford have had an outstanding season. "We faced them in the opening game of the campaign, they surprised us with how quickly they got into the tempo of the Premier League, how well organised Quique Sanchez Flores had the team, the partnership that has been so successful playing up front, and I think they are not a surprise any more. Both sides are desperate to get the form into the league." Watford were challenging for the European spots not long ago but a run of only two wins in 10 league games has seen them slide to 14th, two places and one point below Everton. But the Hornets had overachieved and their priority for the season, safety, has surely already been secured. It is a different story for Everton, with fans growing increasingly angry about results, particularly at home, and frustrated by Martinez's relentless positivity. 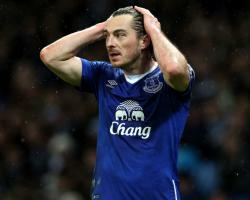 The Spaniard is expected to select Leighton Baines for Saturday's match after the full-back apologised for saying Everton lacked chemistry. Martinez insisted Baines' words had been misinterpreted and there is no problem within the squad. Leon Osman and Steven Pienaar are both doubtful after missing last weekend's defeat by Manchester United with knocks but fellow midfielder Gareth Barry returns from suspension. "He's such a consistent performer, someone that is prepared to do all those jobs that allow the team to be balanced and allow the huge attributes to show." Everton boss Roberto Martinez revealed Leighton Baines has apologised for his widely reported comments questioning the team's chemistry. The full-back told the Liverpool Echo after the Toffees' 1-0 defeat by Manchester United last weekend: "I just don't feel as though the chemistry is quite there with the team on the pitch at the moment, and it hasn't been for a while." "We expect a senior figure at Everton to take responsibility, to make sure that we speak on the pitch, and the way to do that is against Watford." Martinez insisted there is no problem with the atmosphere within his squad. We've been through many situations over the years," the Spaniard said. We're always very open and very clear and the understanding is something that doesn't need clarification." Baines also said Everton were leaning too heavily on certain individuals – a reference surely to Romelu Lukaku and his 25 goals this season. "Of course we rely on individuals because the team is made up of individuals and we've got 15, 16 individuals that have had impressive campaigns, probably the best in their young careers in some cases." We're not a team that we're going to give in in one competition as important for us as the league is. "We know we've got one game in hand – we've got a lot of points to fight for. It's for us now to take responsibility in the league and make sure we get as many points as we can." 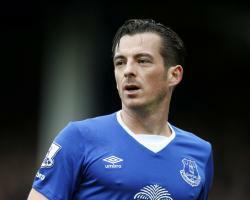 Leighton Baines has claimed Everton's players lack chemistry following a third successive Barclays Premier League defeat at the weekend. The Toffees fell to a 1-0 loss at Manchester United on Sunday and were booed off by the travelling fans, whose side are 12th in the table and level on points with Bournemouth. Although Roberto Martinez's side have an FA Cup semi-final to contest later this month, their league form has frustrated supporters that believe a squad featuring John Stones, Ross Barkley and 25-goal striker Romelu Lukaku should be higher up the division. And Baines insists Everton's current team are not gelling together as they should. Speaking to the Liverpool Echo, he said: "I just don't feel as though the chemistry is quite there with the team on the pitch at the moment, and it hasn't been for a while. "We are maybe leaning too heavily on individuals to come up with something. "We're in games; we were in the game on Sunday and had a couple of chances, but we're not performing as a team to the level we know we can or we should be. "If I had to say one thing, I just don't know if it's there with us at the moment, for whatever reason." That's the third loss on the bounce in the league which is disappointing to us all. That's our season in some respects now, it certainly is from the fans' point of view and we've let them down a lot, it's our only way of making it up to them." 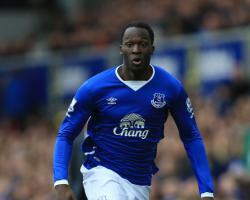 Everton boss Roberto Martinez refuses to consider the prospect of losing leading scorer Romelu Lukaku in the summer. While on international duty, the Belgium striker dropped his biggest hint yet he was looking to leave Goodison Park at the end of the season. "I'm 23 next summer and it would be nice to play in the Champions League next season," he said. Lukaku's 25 goals this season have alerted a number of Europe's top clubs, with agent Mino Raiola this week openly talking about interest from Juventus, Paris St Germain and even Real Madrid. Martinez insists financially the club can compete with the market's bigger players, although it is more likely footballing ambitions will decide Lukaku's fate with Everton out of the running for Champions League qualification, although they do have an FA Cup semi-final to look forward to. "It is not unsettling at all because that should be the aspiration of everyone, wanting to be as good as you can and aspiring to be in the best competitions," said the Spaniard. "We need ambitious players and players who can carry the expectations of our football club. "At Everton we have that aspiration, we want to be in the Champions League, we were knocked out of the League Cup semi-final, we are now in an FA Cup semi-final and we want to continue that momentum. "What we shouldn't be afraid of is losing players. We are in a position where financially we can compete with anyone in the world – things have changed radically in that respect. "At this present time it doesn't really bother me what the individual situations will be in the summer. "The reality is to play for Everton has to be an honour and a privilege. "The only thing that matters now is the team's future. "I'm looking at the talking he does on the pitch and the way he has been growing in confidence this season – that is all that matters." Lukaku has more than justified his £28million club record transfer fee since his move from Chelsea and that is a source of satisfaction for Martinez. The Belgian became the first Everton player since Gary Lineker 30 years ago to score 25 goals in a season. "Three years ago we started working with him having made a huge investment and now you can see why we made that investment," he added. "It is a real satisfaction he has grown into the player we expected him to be. "When you make an investment and you sign a player who doesn't fulfil his potential, that is a worry for a manager. "To have a player growing all the time and becoming one of the best talents in European football makes you extremely proud." We are in a position where financially we can compete with anyone in the world – things have changed radically in that respect. Lukaku has more than justified his Â£28million club record transfer fee since his move from Chelsea and that is a source of satisfaction for Martinez.